Side Table with a Floating Top free plan. For something a little different build this side table which appears to have a floating top. The free plans can be modified to what ever size table you wish to build. Rustic Dining Table free instructions. Build a modern dining table using reclaimed lumber if you wish. The free woodworking instructions are available at the link. End Table free building plan. Use the free woodworking plans to whip up a couple of end tables in no time. This should be an easy build and the X base takes them to another level. Media Console/TV Stand free project. Follow the free step-by-step plans available at the link to build your own media console. It has a slight industrial feel and lots of great display space. Console Table free woodworking plan. 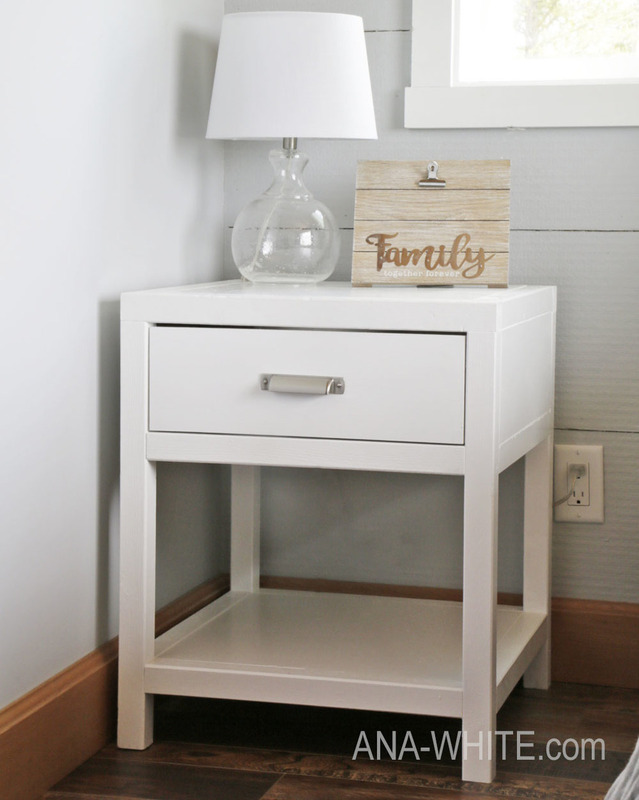 Build this modern farmhouse style console table using the free woodworking plans available at the link. Finished project measures 66 inches long and just over 10 inches deep. Farmhouse Dining Table free plan. Build a modern farmhouse style dining table using the free downloadable woodworking plans available at the link. Bench with Shoe Storage free plan. Use the free woodworking instructions at the link to build a bench for your mudroom or entryway with an added bonus of shoe storage. Round Coffee Table free woodworking plan. Build a round coffee table using the free woodworking plans and instructions available at the link. Bench for Outdoors free plan. Build a handsome bench for your outdoor space using the free woodworking instructions available at the link. Bedside Table free building plan. Build a simple modern bedside table using the free woodworking plans available at the link. It measures 24 inches high and the top is 20 x 20 inches square.